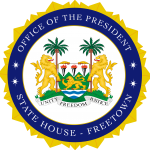 State House, Freetown, Friday 29 March 2019 – The newly appointed Solicitor General of the Republic of Sierra Leone, Mohamed Lamin Tarawalley, has subscribed to the Oath of Office before His Excellency President Julius Maada Bio in accordance with the Constitution during a ceremony held at State House. He said he was aware that there were challenges but vowed not to betray the trust of the President, adding that the New Direction Government had made tremendous strides in revamping and restoring trust in the legal system of the country. “Good laws and good legal system are part of the development and growth of any nation and I commend your government on that. It is my pleasure to work in tandem with the Attorney General to build, develop and improve the justice department otherwise known as the Law Officers’ Department, which is the largest government law firm. If our laws must be respected, we must respect them and to me this is doable,” he said. In his brief response, President Bio congratulated Lawyer Tarawalley on his new role, saying that he had been meticulously chosen and therefore much was expected of him because the country was lagging behind and that a lot of work was required to catch up with the rest of the world. “We are beginning to find our place in society and we should continue on that part. That is why I want to encourage everyone to put their hands on deck because this is not something we can do alone. Now is the time to work and there are very good signs that we are on the right track. Therefore, as you join us, I want to implore you to continue to work very hard. On my part, I promise to provide the quality leadership necessary to change the bad reputation of the country,” he said.